A North Side man has been arrested in connection with two robberies this week near his Edgewater home, police said. Stanley Krzak, 26, of the 5400 block of North Broadway is charged with two felony counts of armed robbery with a firearm. He is due in bond court this afternoon. Krzak was arrested Thursday near his home after police identified him as the man who robbed a convenience store and a Pizza Hut in Edgewater earlier this week, police said. His first target was the 7-Eleven store at 1055 West Bryn Mawr around 12:09 a.m. on Sunday, Nov. 25th, according to police. After producing a handgun and getting about $150 cash from the clerk, Krzak fled westbound on foot, according to the allegations. Krzak allegedly struck again at 9:05 p.m. on Monday. That’s when police say he walked into Pizza Hut, 5320 North Broadway, and demanded the restaurant’s cash while threatening employees with a gun. He was reportedly handed about $180 before he fled northbound on Broadway. 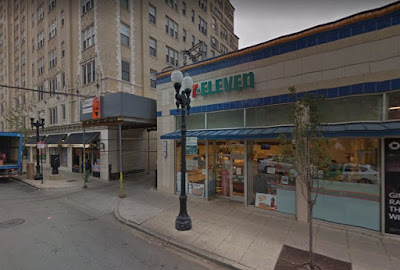 In a community alert issued on Tuesday, police said the robber they were seeking in connection with the Pizza Hut and 7-Eleven robberies was also responsible for robbing an Andersonville Walgreens at gunpoint around 5:10 p.m. last Sunday. Krzak has not been charged with that robbery, according to information released today by Chicago police. However, CPD's 20th (Lincoln) District said in a tweet that detectives are working to link more crimes to Krzak. Police said in a statement that Krzak is a convicted felon, but further details about his background were not immediately available.